anti-aircraft guns on the Barrington Road. “Although Orwell was mercifully distant from industrial areas of Britain that suffered the Blitz of the Second World War, it was affected by raids on the airfield at Bassingbourn and by the presence of a searchlight battery and anti-aircraft guns on the Barrington Road. Fund raising events were held in support of all the National War Savings Weeks, the village hosted several groups of evacuees, and everyone was of course subject to the restrictions of food, clothing,and petrol rationing. 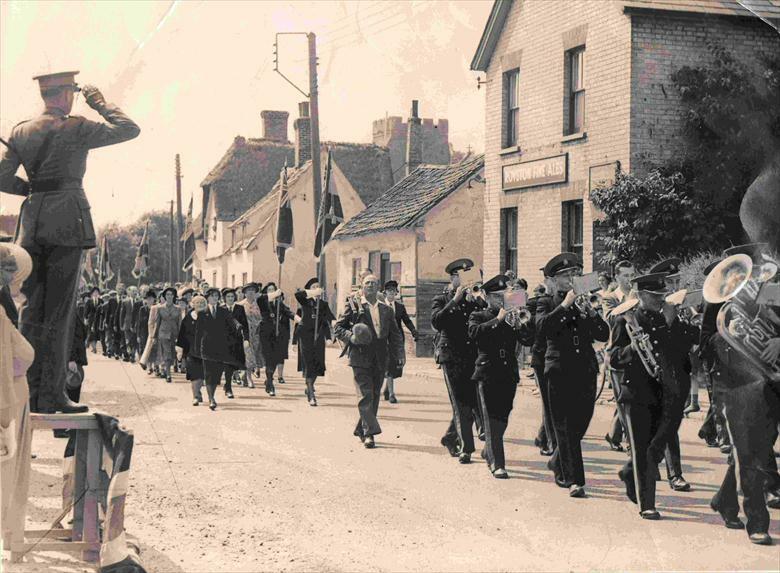 On Sunday 3rd of September 1939 my father George Peters, was brought the news of the declaration of war to the congregation at St. Andrews morning service. The air raid sirens sounded for the first time shortly afterwards, though no aircraft appeared. Everyone had their gas masks ready, windows were blacked out, and the village hall was packed out for a WRVS recruiting drive. My Mother knitted jumpers for all the Orwell men who went into the armed services. Our air raid siren was located at the Rectory and was backed up by myself, cycling round the village while blowing a whistle to warn of impending attacks. This page was added by Pat Grigor on 13/09/2012.